Kumon is an after-school math and reading program developed by Toru Kumon and founded in 1958 in Osaka, Japan. In 1974, Kumon first advanced into overseas markets in New York. Now the Kumon method is the largest mathematics and language educational system in the world. There are over 4,220,000 students and 26,000 Kumon Centers in 46 countries. In the Kumon, students work on their own worksheets instead of study as a class, and they progress through the curriculum at their own pace. By this system, students are not compared with one another, and they can focus on how they improved. How the Kumon method was born is a well known story in Japan. The founder Kumon was a high school math teacher, and to help his son’s math problems at school, Kumon made worksheets for him. His son solved the worksheet after school, and Kumon corrected it after he got home. By repeating that, Kumon developed the method. 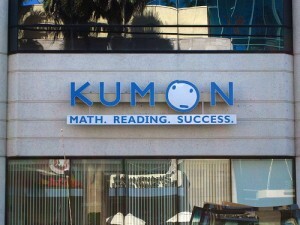 As you can see in the Kumon’s logo, there is a face in “O”. It’s called “THINKING FACE”, and it refers their motto “keep thinking and grow up”. It’s not just a student’s face but represents the face of everyone involved in Kumon including teachers and parents.